Cincinnati Christian University (formerly known as Cincinnati Bible College & Seminary) was established in 1924 and has served the Cincinnati area for over 80 years. In the fall of 2004, President David Faust unveiled the new CCU name and logo. The festivities were titled "Lighting the Hill" which represented a renewed commitment to being a light in our Price Hill community and the city of Cincinnati. 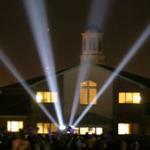 However, Cincinnati Christian University not only wants to be a light in the community but to light the hill of Calvary—lighting the way for men and women of all ethnic groups to obtain a degree of higher education in a Christian environment in their preparation to light the world for Christ. To teach men and women to live by biblical principles and to equip and empower them with character, skills, insight, and vision to lead the church and impact society for Christ.